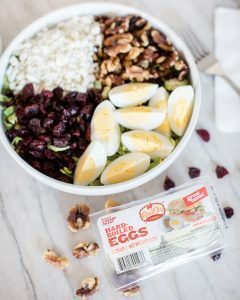 Salads are an egg-cellent idea when entertaining! I am an avid cook, and love creating new concepts for meals, whether it be for our immediate family or when we host friends and neighbors. One of my favorite things to make is a fresh salad, along with a handmade dressing. After making dozens of different salad dressings over time, I have learned to appreciate the difference between a pre-made store bought version and the ones I create. But while some things are better when created from scratch, others are better pre-made. 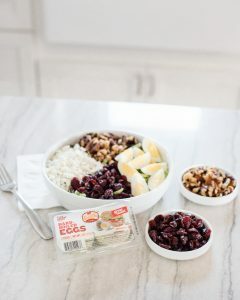 Our family has fallen in love with Great Day Farms peeled & ready to eat hard boiled eggs. 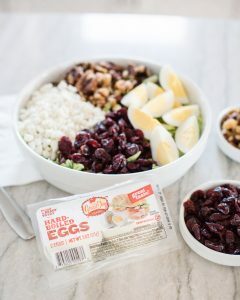 Not only do we use them in egg salad and snack boxes, they make the perfect addition to a variety of salads. Today, I am sharing one of my favorite salad recipes; chopped brussel sprout salad. It’s delicious, and with a few simple ingredients, it’s quick and easy to make for any occasion. 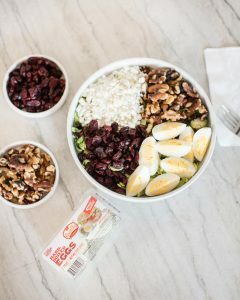 Toss together the 5 primary chopped salad ingredients in a large bowl; shaved brussel sprouts, toasted pecans, dried cranberries, chopped or sliced hard boiled eggs and goat cheese. To create the dressing, whisk together the extra virgin olive oil and apple cider vinegar in a small bowl or mixing cup. Next whisk in the Dijon mustard. Using a small mixing spoon, blend in the minced garlic, then season to taste with salt and pepper. Note: the dressing can be prepared ahead of time and stored in the fridge to reduce prep time during your event. Chef Tips: Over time, I have figured out some short cuts for creating this salad recipe! First, pick up a bag of pre-shaved brussel sprouts in the produce section of your local Walmart. 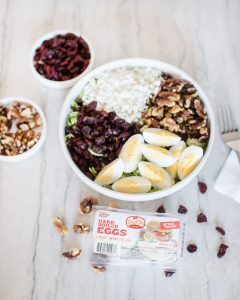 Next, pick up a bag or two of Great Day Farms peeled & ready to eat hard boiled eggs in the deli section, available as a 2-pack or 6-pack. Create this beautiful and delicious chopped brussel sprout salad recipe at home for your family, or your next gathering, in just minutes! We hope you love it as much as we do. What is your favorite salad recipe when entertaining guests? Share in the comments below. Browse our other entertaining recipes for more inspiration!